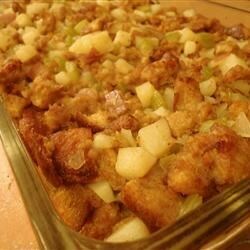 "This potato and sausage stuffing is best prepared with homemade bread cubes." Really good recipe. I made it in my crockpot (45 minutes on high, 3-4 hours on low.) and it came out wonderful. Everyone loved this stuffing. Instead of baking in the oven, I placed it in a slow cooker for 4 hours--it was great. However, if you do this, be careful not to make the stuffing too wet. This has to be the best stuffing we have ever tasted. It is absolutely a Thanksgiving must.